Clearly these ribs, but also some other fun things too! First, my younger brother, Kai got into the school he wanted (FIDM) in LA and I could not be more exited for him. When he told me, it pretty much made my Monday. I might just be living vicariously through him though. He will be attending the same school that I always thought I wanted to go to…until I didn’t… and decided to change career paths… did a complete 360… and here I am. It’s a long story and I have told it before, so I will not go over all the details and bore you…again. But really, I am SO exited for him. I think it will be the perfect school for him, he is going to KILL it in the filming world. And ok, I am pretty exited he is going to be in sunny, warm LA. The land of food photography props galore. Yess. Alright, and equally exciting is some news about the goats. You remember yesterday how I said we would not be receiving milk from our goats until next summer? Yeah, well Heather, the woman who we bought our cute little goats, Mara and Layla, from emailed my mom telling her the birth stories of the two girls and giving us their lineage. She also said that she was going to need to cut down the size of her heard with their next round of babies and asked if we would be interested in taking a milking goat, Mara’s dam (mother) Tiramisu. Well, that’s what I said when my dad told me, BUT he’s a little scared to be taking on a milking goat with everything we already have going on…so I am working on him. And I need him on board because I definitely don’t have enough time to be milking goats twice a day, BUT I so want the milk. Like SO bad. The days need more hours. Yes, like a lot more hours. 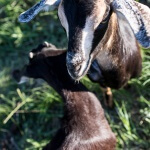 So while this is not a done deal, I have both my fingers crossed…Tiramisu, she even has the perfect name – once we get her I promise to make some tiramisu with goat’s milk! I will update you on this front, once I know a bit more. Ok and third, I spent most of Monday with little miss Asher. I haven’t spent a whole day with her since I officially moved out of the “rents” house. My family went rafting, so Asher was stuck with boring, always working me. She talked my ear off, somehow convinced me that making a cake was a good idea (in the midst of my already messy, food filled kitchen) and then stole my laptop and watched gymnastic on YouTube for like two hours. We also maybe danced around the kitchen screaming (cause neither of us can sing) the entire Taylor Swift 1989 album while we made the said cake. FYI, the girl know all the words to every song. She’s six and probably Taylor’s BIGGEST and littlest fan ever. She knows it all. Oh, and Asher also made this sweet comment, “Tiegs, all the food you made today is beautiful”. And then she asked to make a cake. Girl sure knows how to play me. 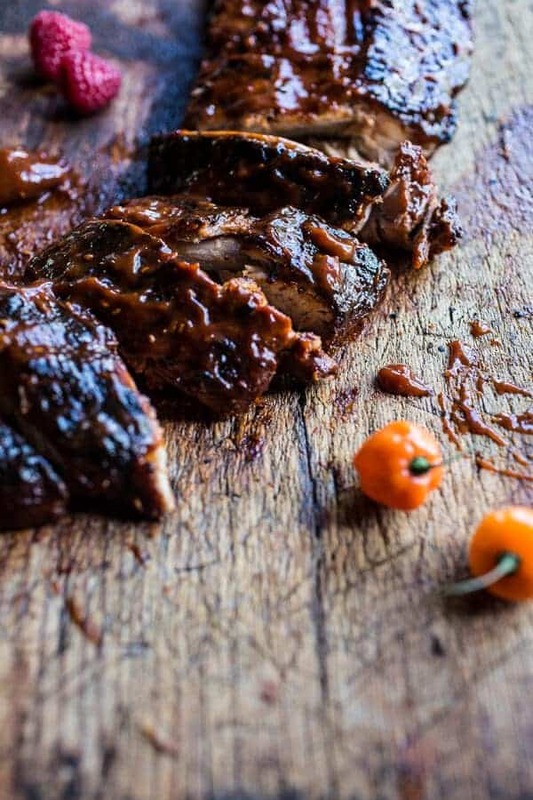 But the best part of this post is most definitely these fall off the bone, spicy, sweet and bone lickin’ good, crockpot grilled fiery habanero apricot BBQ ribs. 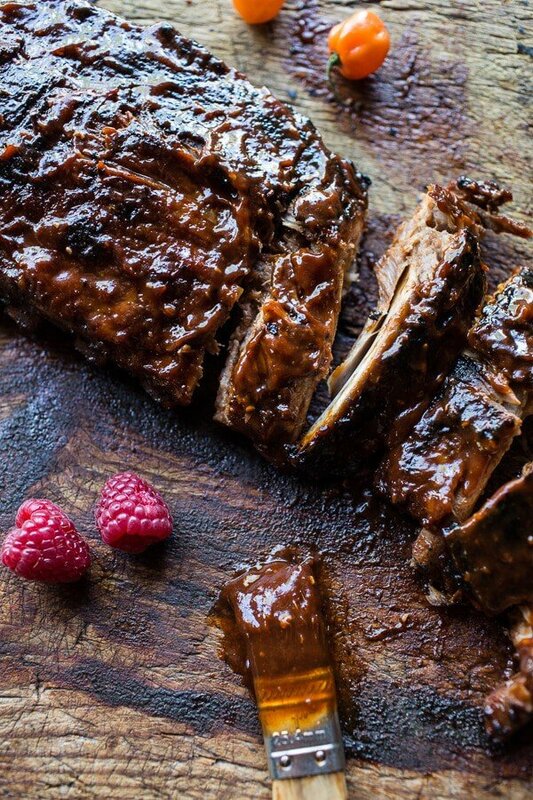 You guys, the crockpot is the magic way to cook ribs. Like no joke, these ribs came out perfect. In fact, the Colorado BBQ Challenge was in town over the weekend and the entire family agreed that the chewy ribs they had there didn’t even come close to my ribs. But then again, my BBQ sauce is kind of amazing too. 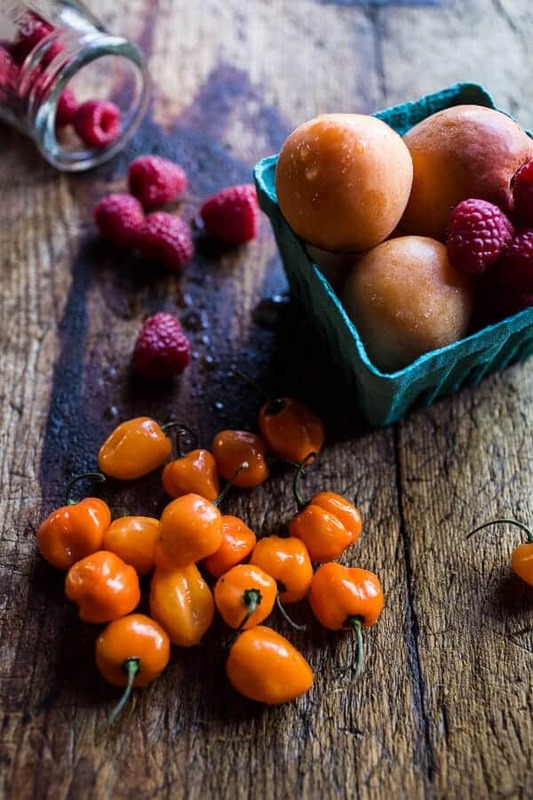 It’s spicy, sweet and full of summer fruit. 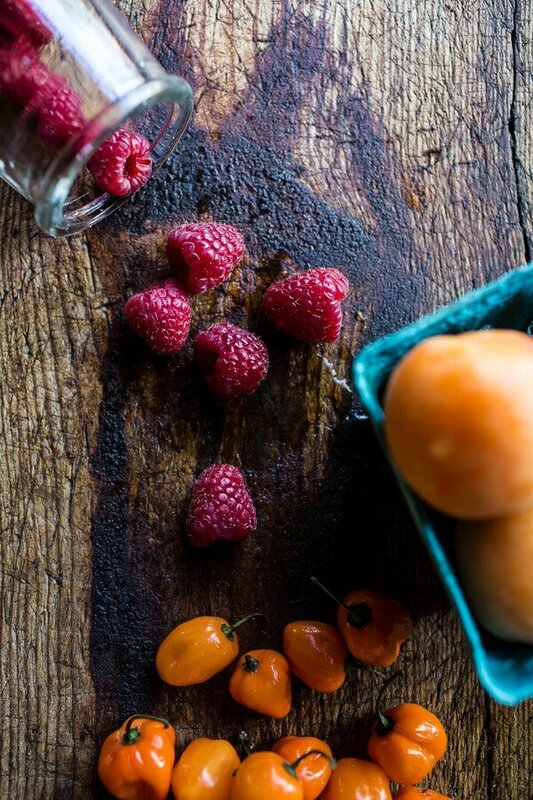 I know it seems a little weird to be adding fruit to a BBQ sauce, but when paired with those spicy habanero chilies it’s the perfect balance of sweet and spicy. Clearly, I have the 4th of July in mind for these ribs. Cook them in the crockpot all day long and then just throw them on the grill right before eating. Could not be an easier or more delicious way to do it. 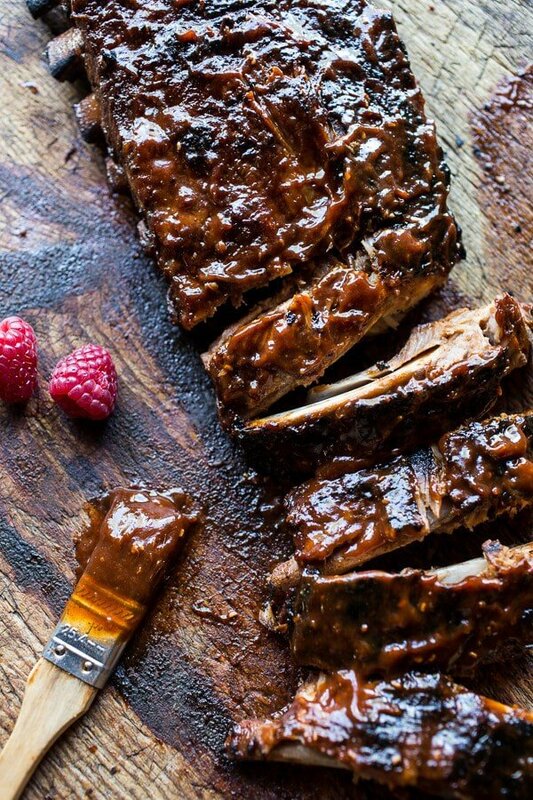 If you do decide to make these for the 4th, you can easily double the recipe to make enough for two racks of ribs. My crockpot fit two full racks, but I don’t think it could fit a third. If you are looking to cook 3-4 racks, I would see if you can borrow a crockpot from someone you know. Kind of a pain, but I promise, once you try ribs in the crockpot you won’t be going back to whatever you did before. AND the cleanup is so easy too! Grabs the ribs and place them on a cutting board. Take a butter knife, wedge it just underneath the membrane to loosen and pull the membrane up and off the bone. Then just use your hands to pull the rest of the membrane off. In a small bowl, combine the brown sugar, smoked paprika, chipotle chili powder, garlic powder, cinnamon, salt and pepper. Rub the mixture all over the ribs. Place the ribs in the bowl of a crockpot and pour the beer into the crockpot. Cover and cook overnight or 6-8 hours on low. Sometime while the ribs are cooking, make the BBQ sauce. 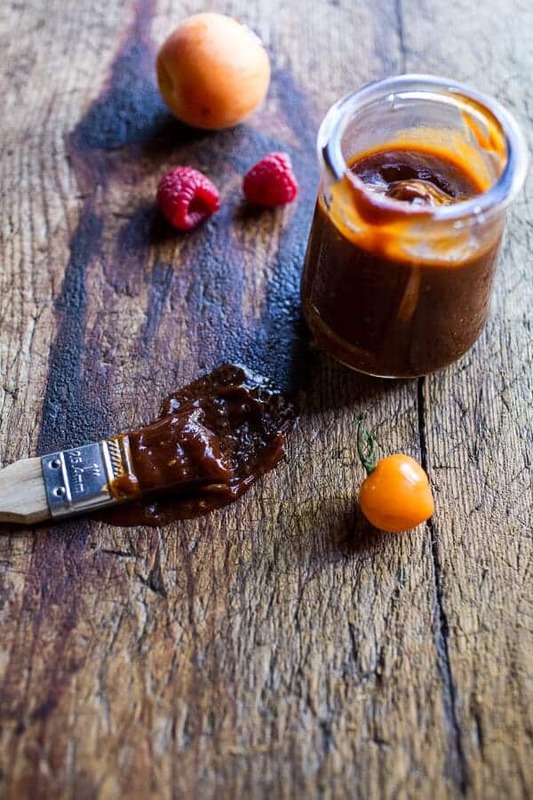 Combine all the ingredients for the BBQ sauce in a medium size sauce pot. Bring the mixture to a boil and cook until the apricots are very soft, about 10-15 minutes. Once the fruit is soft, remove from the heat and allow to cool slightly, then puree the sauce in a blender until completely smooth. Pour into a glass jar. Store any leftovers in the fridge. Once the ribs are finish cooking and you are ready to grill them, preheat the grill to medium high heat. Remove the ribs from the crockpot and brush them with the BBQ sauce. Be careful when handling, the ribs are they are really going to want to fall apart. This is obviously what you want, but it does make them a little tricky to handle. Place the ribs on the grill and grill for 5-8 minutes or until light grill marks appear. Carefully remove the ribs from the grill and onto a serving plate. Brush with more BBQ sauce and serve warm. Enjoy!! I mean come on, don’t these look delicious?!? 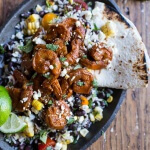 Chipotle Enchilada Shrimp with Rice and Beans. your sister sounds like the cutest (and that sounds like fun screaming taylor swift and baking cake, even it was already chaos in your kitchen). as always, love how you’re incorporating fruit into everything! Congrats to your bro. No Taylor Swift here, I guess I just don’t listen to her music, it’s not bad, just not my thing. Goats sound great. And these ribs are my manly men. Going to ask my Mother In Law to make them for me, she’s pretty good with that. Congrats to your brother! And little sisters always have a way of convincing us, once mine convinced me of making profiteroles while we were making dinner. The ribs look great specially the BBQ sauce! I hope you get Mara’s dam and I’m going to be looking forward to that promised tiramisu if you do. Asher is so adorable and it sounds like she would totally hit it off with my 6-year-old sis, Sophie, who also possesses the power to coax people into doing things she wants. 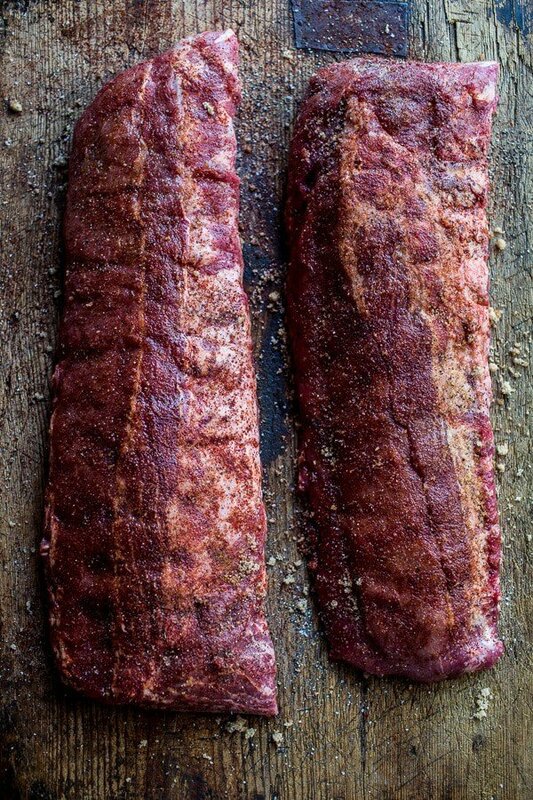 I am so doing these ribs if I ever get a crock pot but Chile is kind of lacking where those are concerned. I’m definitely making that sauce though, yum! Seriously? Goats?! How do I get your life. I WANT IT. I also want these ribs something CRAZY, because they look amazing! Pinned! What if you tied string around the ribs to help keep them together when transferring to the grill? I wonder if that would be more of a help or a hindrance when putting on the BBQ sauce? Just a thought…. I would say go for the goats!! All that delicious milk! And boy Asher does know how to work it huh?! Was the cake blog worthy because I ams sure it was delicious and gorgeous! 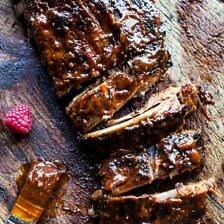 I cook ribs in the crock pot all the time – so easy and if I didn’t just have ribs last night I”d be making these !!! They look fantastic!! I can feel my tastebuds tingle just at the thought of these!! By the way, the ribs look DIVINE. My husband is going to love me forever when I make these for him. I ran out to the grocery store early this morning, to get everything that I needed as soon as read the recipe. I cannot wait to try these! Yes, I know exactly how I want to prepare the ribs I got on Sunday Love the summery flavors, and that meat looks unbelievably tender. i don’t have a grill. Can I just broil it in the oven a bit? Yup, that will work great! Hope you love them! I’m interested in someone who has actually tried this recipe and the results. That would be helpful. Other comments are useless for a reader. Hey man, we are showing our love! And there are all kinds of hints and results. Omg the goat’s name is Tiramisu??? That is soo cute!!! Haha awww, your sis sure knows how to get ya! And congrats to your bro, so exciting! Annnndddd these ribs. Finger. Lickin’. Good. How many litres/gallons (or whatever you measure it in) is your crockpot? I have and 8quart crockpot. Let me know if you have any other questions. I finished dinner a couple hours ago, but if these were in front of my face I would eat them. All. Ok most. Looks so good! drooling over here right now. I live in a land where bbq sauce is a rarity and i dream of bbq like this! I think I can tackle this problem with this recipe. Congratulations to your brother and thanks for the recipe!. BTW, there are no apricots in the recipe? 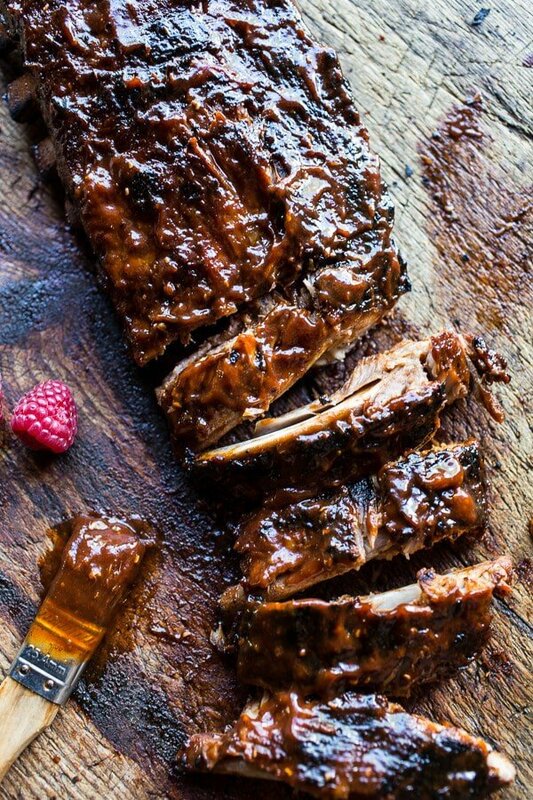 These ribs look sticky delicious, I’m loving that apricot bbq sauce! So good! 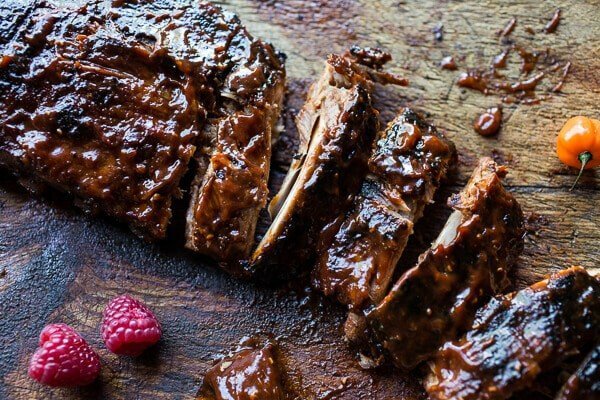 If I do not eat pork, is it possible to do this with beef ribs? Would they be as tender? I think that would be fine, but I personally have never tried it so I cannot say for sure. I do think the beef ribs would be great though. Let me know how it goes! Tracy they will be just as tender with beef – trust me! I am a BBQ aficionado, my middle name is all things mexican and bbq. I have made tons of Pork and Beef bbq’s. 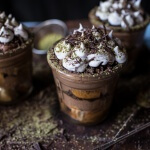 This is the third recipe of yours that I have tried – you continue to amaze me! Keep up the good work. I love your blog! Tieghan…..this was sooooooo good!!! The ribs were tender, meaty, and the sauce was amazing. We had 4 people over for dinner last night (6 people total), and I used 3.5 pounds of ribs. It was barely enough to feed six, especially since everyone wanted way more because everything was so delicious. Next time I”ll have to try and fit 2 of them in my crockpot. I think at least 0.75-1 pound of ribs per person is a good approximation. I served this with your beer bread as well as a simple salad and my own recipe for blueberry apple pie for dessert. -I used regular chili powder instead of chipotle chili powder. -We don’t have a grill and I wanted to make sure they would be flavorful, so I browned/baked in a 400 (F) degree oven for about 20 min before putting in the crockpot (not sure this actually did anything….I’ll probably skip this step next time). -After the ribs were falling apart, I put the sauce on them and then baked them in the oven at 400 degrees F for 10-15 min (watch the sauce to make sure it doesn’t burn!). While you could broil them…baking was really easy and I didn’t want to risk scorching the sauce. I halved the BBQ sauce recipe and now I’m really thinking I should have made the full batch and put the leftovers in the freezer. It was so yummy. My husband and kept talking about the ribs before we went to sleep and how we need to make them again! SOOO Happy you guys loved this and adapted it to your need. THANK YOU! 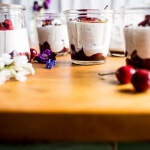 Amber you are so lucky to have a husband that likes food – mine thinks my sisters and I are obsessed with food (we are) and HalfBakedHarvest is the perfect site to indulge! I’m DYING to try these, but I’m wondering – how hot are they? I like spice, but I have to admit – I got a little nervous when I saw the recipe note about wearing gloves – haha! I’m thinking maybe I’ll just cut down on the number of habaneros since I don’t want to leave them out altogether. Brie can’t make them hot enough for me, haha. But you still need to wear gloves no matter how many you use. One tip, if you take out the seeds it will be less hot, that is where most of the heat is – Good luck! I absolutely Love this recipe! I made it just today for my Husbands Birthday ~ He Loves Ribs! Every Single one of your recipes are right up my alley ~ Love it! I am so glad I found you ~ Thank you! Thank you Christina! So happy you guys have liked everything! These are The. Best. Ribs. Ever!!!! Making them a second time right now. Served them first time for friends and they are still talking about them. Love your recipes! YES!! So happy you and your friends are loving this recipe Ginny! Thanks so much! ? Teighan – you have done it – again. I usually bake my ribs in tinfoil for an hour or two or three (depending on how many) and then use broiler. Same premise here, only much easier and no heating up house. Anyone who cooks will know that these flavors will be fabulous together! I can’t wait to try these, after the tacosenchiladas and such have been done, as they are my fave. BBQ ribs are next on the Halfbakedharvest menu! Awesome! I hope you love these Reni! Enjoy! There’s not much salt in the rub for a whole rack of ribs. Did it taste under salted? Hi Stan, The amount of salt should be fine, but please feel free to add more to your taste. Hope you love these and let me know if you have other questions. Thanks! When you say 1 oz beer, then 12, you mean one 12 oz beer correct? I use 12 oz. I’ve made this a multiple times and if you don’t have a good seal on your crockpot the liquid evaporates and the sugar will burn on bottom one the crockpot. So I sometimes have to add more beer to keep it from drying out. Yes, it is a 12 ounce beer. Thank you! So sorry, it is 1 (12 ounce) bottle of beer. I wanted to use apricot preserve or jam in place of apricots to be able make this recipe year round. Can I use jam instead and how much do I use? I love your blog and your recipes, they’re so different and fun! Your content is very useful. I like it most. Thank you for sharing. It is very good. I like your site very much. I’m very good at it. Thank you! I am so glad you like my recipes!